Unmatched Performance — Alta Devices technology holds the single junction solar efficiency record at 29.1%. Our solar cells produce more power per unit area than any other solar material on the market. We begin by growing a thin layer of GaAs on top of a single crystal GaAs wafer using a high throughput metalorganic chemical vapor deposition (MOCVD) process. We then remove this thin layer via an epitaxial lift-off (ELO) process which leaves a thin, flexible, and lightweight solar cell. 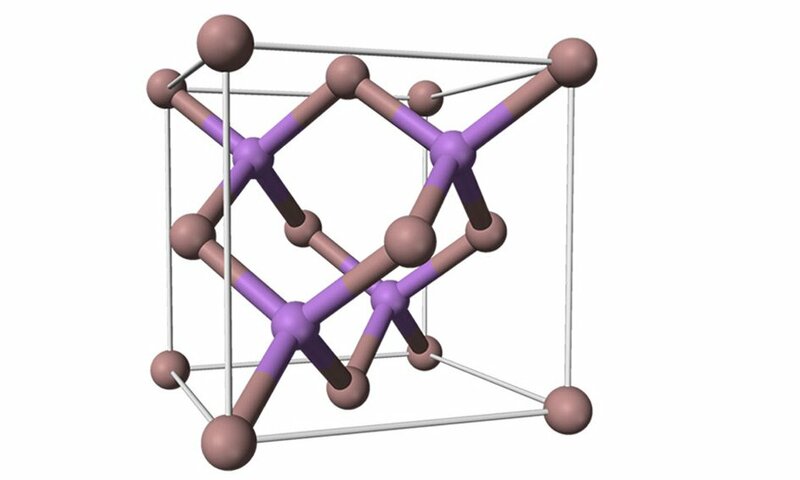 The backbone of our entire technology is gallium arsenide (GaAs) which is a III-V semiconductor with a Zinc Blende crystal structure. GaAs solar cells were first developed in the early 1970s and have several unique advantages. GaAs is naturally robust to moisture and UV radiation making it very durable. It has a wide and direct band gap which allows for more efficient photon absorption and high output power density. 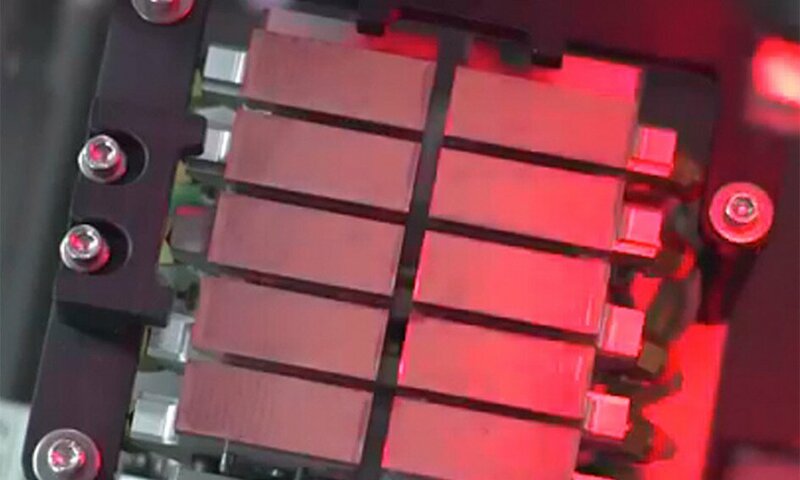 Finally, it has a low temperature coefficient and strong low light performance. Alta Devices houses three unique tools that allow for the mass production of thin film GaAs. First, our metalorganic chemical vapor deposition (MOCVD) tool allows for the simultaneous growth of thin GaAs film on top of our single crystal GaAs wafers. Process time for the MOCVD tool is measured in minutes and the tool is capable of producing hundreds of watts of solar cells per hour. Second, our Epitaxial Lift Off (ELO) tool is the largest of its kind in the world and allows for the separation of the GaAs film from the wafer. Last, our matrix assembly tool allows us to build customized solar modules to match customer power requirements. In addition to being a direct band gap material, we are able to achieve our record breaking efficiencies through the observed phenomenon called “Photon Recycling”. In this process photons bounce off the back of the solar cell which allows them to be recaptured by the material and converted to electricity. Thus, more energy is captured where it would have been lost using traditional solar technology. At Alta Devices we are constantly looking for ways to improve our product line. 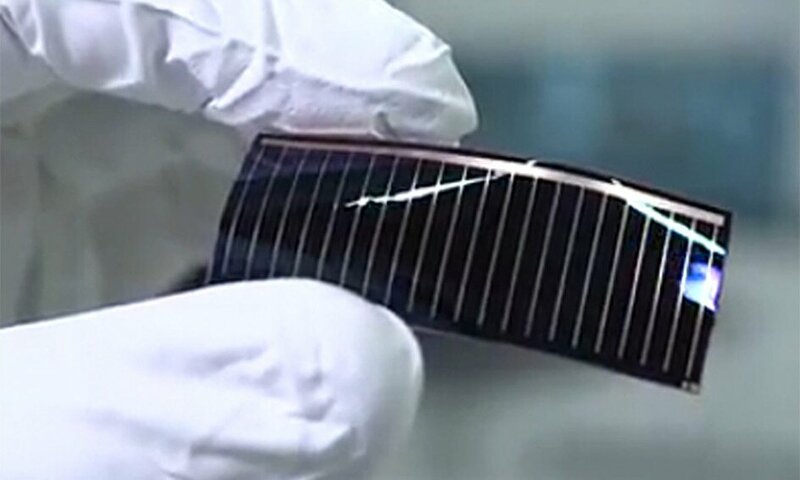 Our first generation products, introduced in 2010, demonstrated our ability to mass produce the highest efficient and thinnest single junction solar cell on the market. 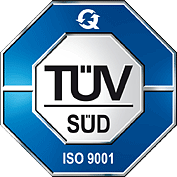 Over the years, we have continued to improve our performance and reliability while reducing weight. Currently, we manufacture and sell our fourth generation (Gen4) product line. Gen4 represents a 30% reduction in mass resulting in an areal density of 170 g/m2 unencapulated. We are also introducing several performance improvements that will result in a more efficient and reliable product. Along with our unique interconnect process, Alta Devices will provide customers with the best power-to-weight and power-to-area combination available on the market. While Gen4 represents a significant performance increase for our customers, it also will allow Alta Devices to achieve our rated capacity in Sunnyvale, California. Ultimately, allowing our costs to decrease significantly to further disrupt traditional solar technologies. 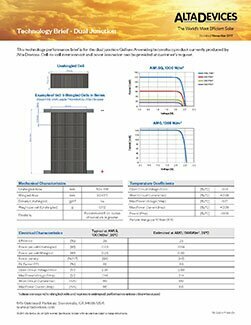 This brief provides typical electrical performance information for our single junction solar cells. This brief provides typical electrical performance information for our dual junction solar cells.